In this week’s episode of Warrior of the Week, TickPick is proud to highlight Mark Wedlow. Mark was enlisted was the Air Force and currently provides security in Las Vegas. 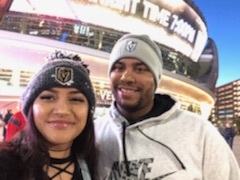 As an avid hockey fan, Mark chose to attend the Vegas Golden Knights vs. New Jersey Devils. Choosing which branch to serve wasn’t the easiest choice, but Mark ultimately served in the Air Force because that was the branch his father served. In addition to the pride of serving his country, Mark is grateful to the military for the opportunity to provide for his family. TickPick is proud to announce Warrior of the Week! We would like to thank US veterans for choosing to serve our country with free tickets to sporting events all across America. There are never enough ways to thank our veterans and their families. While still far from enough, we hope that a memorable night cheering on their favorite team will begin to show our appreciation. Do you know a veteran or active duty soldier deserving of TickPick’s Warrior of the Week?